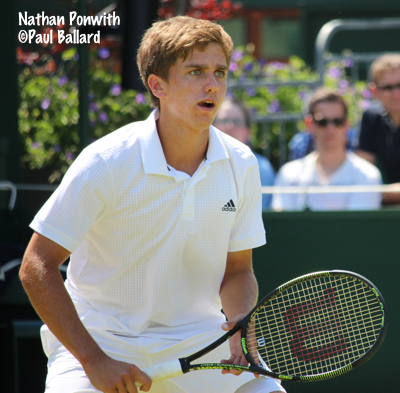 Eight of the nine US juniors in action on a gorgeous English summer day celebrated the 4th of July with victories as the Wimbledon championship began at the All England Lawn Tennis Club. Fifteen-year-old Claire Liu and 17-year-old Nathan Ponwith had markedly different paths to the second round, with Liu defeating No. 13 seed Luisa Stefani of Brazil 6-0, 6-1 in 45 minutes, while Ponwith had his first taste of an advantage third set, beating Yusuke Takahashi of Japan 4-6, 7-6(5), 8-6. Liu, who is making her first appearance at Wimbledon, hadn't had an opportunity to practice at the site until she warmed up there this morning. 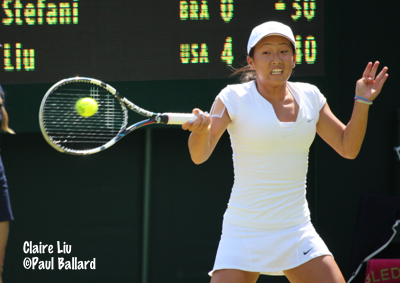 "Yesterday we practiced at another place and I was hitting at the Roehampton courts the whole time," Liu said. "But we went to Eastbourne before Roehampton for the Maureen Connolly Cup, so that was good." Liu said she likes grass, despite her limited experience on the surface. "Because I like to try to take time away and stuff, it's really nice that the courts are fast and it's hard to move on," Liu said. "If I can get the first good ball in, I can start the point well." Liu said she was nervous in her Wimbledon debut, but having played the US Open juniors twice already, she wasn't overwhelmed. "I was really nervous in the beginning, because I wanted to do well here," said Easter Bowl champion Liu, who is just returning to competition after a torn labrum that did not require surgery. "The first couple of matches in a grand slam, it's hard. The first time I was at the US Open, I was really nervous, people were watching me and that was the first time that had ever happened, but it certainly has helped me with dealing with my nerves better." While Ponwith wasn't as convincing in his victory, he was happy with the way he played, particularly at the very end of the second set tiebreaker and in the final set. Ponwith had failed to serve out the set at 5-3, and Takahashi, serving at 5-6, saved a set point with a huge backhand winner. In the ensuing tiebreaker, Takahashi had the match on his racquet when Ponwith lost both points on his serve to go from 4-3 up to 5-4 down in the second set tiebreaker. The 17-year-old from Japan, who, like Ponwith, was playing in his first Wimbledon, netted a defensive slice for 5-5, and Ponwith got his set point with a forehand swing volley winner. Taking his time, Ponwith collected himself, went to his towel, and hit one of his best serves of the match, which Takahashi could only get his racquet on. Up a break at 2-1 in the third set, Ponwith lost it, but neither dropped serve until Ponwith got a break at 6-6 in the third. "We were both playing well throughout the third, holding our serves," said Ponwith. "I faced a couple of break points at 3-4 and was lucky to not get broken. At 6-all 15-40, he hit a big serve and saved that break point, but I was able to break at 30-40 on a lucky shank return that he ended up missing. But I'm thankful for it. I played really well today and we both brought really good tennis." Ponwith said that failing to serve out the second set never entered his mind when he went to serve out the third set. Down 0-30, he won the final four points of the match, finishing it with a forehand winner. "I actually forgot about that," Ponwith said of his previous inability to close. "I got a little bit nervous, but after 0-30, I calmed down, maybe hit a couple of big serves. And the big forehand, that was nice." Like Ponwith, Michaela Gordon was also two points away from defeat before she reversed her fortunes with some aggressive play to beat Rebeka Masarova of Switzerland 6-7(2), 7-6(5), 6-2. Trailing 5-3 in the second set, Gordon fell behind 5-3 in the second set tiebreaker after double faulting. But two aggressive, line-seeking winners made it 5-all and a forehand just wide by Masarova gave Gordon a set point. Another winner and she had the set, and the 15-year-old Californian, who was a quarterfinalist here last year, was into the second round. Seconds later, Caroline Dolehide joined her there, defeating No. 14 seed Julieta Estable of Argentina 6-4, 4-6, 6-2. Dolehide's ability to finish a point with her forehand providing the difference in the match. Ingrid Neel has always thought grass would be her favorite surface, and she does have a title on grass at last year's ITF Grade 4 in Philadelphia, but Wimbledon is obviously where she would have her best chance to prove it. Her debut went well, as she used her net instincts to outmaneuver 15-year-old British wild card Lauryn John-Baptiste 6-4, 6-2. "Even before stepping on the court, just being around here, well, one, it's beautiful," said the 17-year-old Floridian, who reached the semifinals at Roehampton Thursday. "Two, the grass. It's my favorite surface. That sounds weird, since I've only played two weeks on it or less, but I think it will be my favorite surface throughout my career. Today the match went very well. I held serve nicely, which is very key on grass. There were some nerves, but I really couldn't ask for a better first day at Wimbledon." Neel knew nothing about her opponent, but in that situation, she prefers to focus on her own game. "I mostly think, I'm just going to try to get into net," Neel said. "Early on I just tried to figure out her weakness and strengths. Her forehand was her big shot, she loved it. But yeah, it's different when you've played a player many times, very different than when you've never seen them before. Both can be equally tough, so I'm glad it worked out today." Fifteen-year-old Kayla Day also had a successful Wimbledon debut, defeating Tessah Andrianjafitrimo of France 7-6(5), 6-3. Wild card Tornado Alicia Black, who reached the quarterfinals here last year, need just over an hour to dismiss Canadian Katherine Sebov 6-2, 6-1. No. 6 seed Usue Arconada avenged her 2014 Orange Bowl loss to Monika Kilnarova, but it was far from easy, with Arconada taking a 7-6(7), 6-7(5), 6-3 victory over the 15-year-old from the Czech Republic. Francesca Di Lorenzo was the US junior to lose Saturday, falling to 14-year-old wild card Anastasia Potapova of Russia 7-5, 6-3. The doubles draws are out, with Taylor Fritz and Michael Mmoh the top seeds, Tommy Paul and William Blumberg are the No. 3 seeds and Reilly Opelka and Akira Santillan of Japan are seeded No. 4. In the girls doubles, Arconada and Canadian Charlotte Robillard-Millette are the No. 2 seeds, and Stefani and Di Lorenzo are the No. 8 seeds. Complete draws are available at the Wimbledon website.